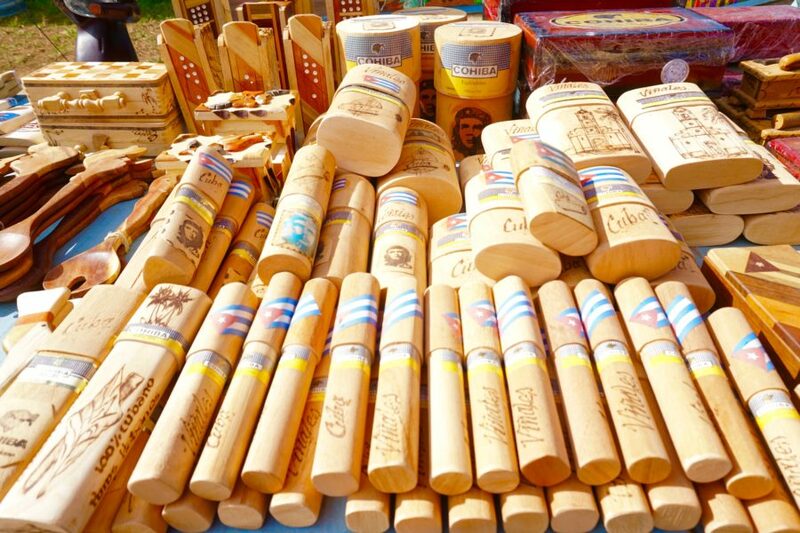 Before we get to the best souvenirs in Cuba, let’s answer the question everyone seems to have– yes Americans can legally bring home Cuban souvenirs. This question can be confusing because it’s true that a mere two years ago, all souvenirs from Cuba were completely illegal for Americans to bring back to the United States. But since early 2015, all of that has changed. A recent update to US regulations in October 2016 has taken Cuban souvenir shopping even further, effectively removing all meaningful limits on what you can bring back home (check the regs, but as long as you are in Cuba legally and your souvenirs are for personal use or gifts, you’re probably good). So now is the time to head down to Cuba and souvenir shop your heart out. In theory at least. Cuba is still a socialist country, with complicated restrictions on private ownership and entrepreneurship, so most Cuban shops are government owned. US and other sanctions limit the goods Cuba can import, which in turn limits what they can produce and sell. Shortages abound and a ration system still exists to this day. 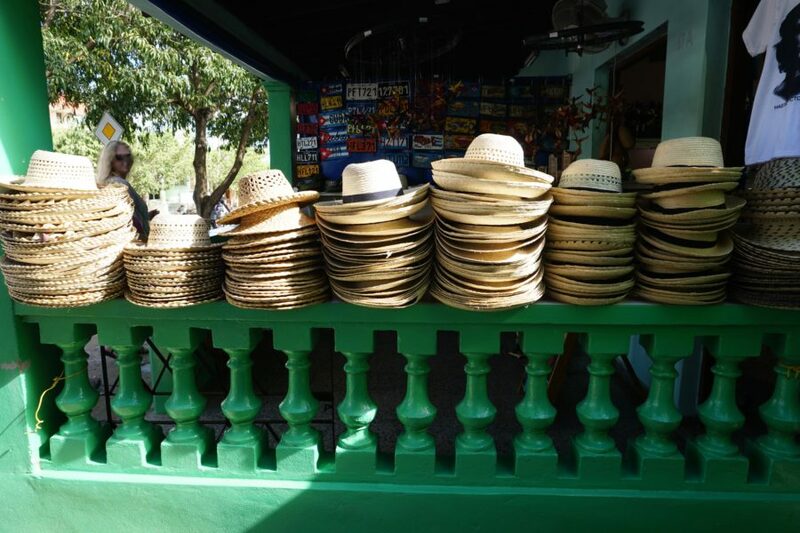 While Cuban souvenirs might not have the variety you’ll find elsewhere, they certainly have the hard-to-get cachet– as in previously impossible to get for the last 60 or so years. That alone makes souvenir shopping in Cuba kind of a thrilling experience. 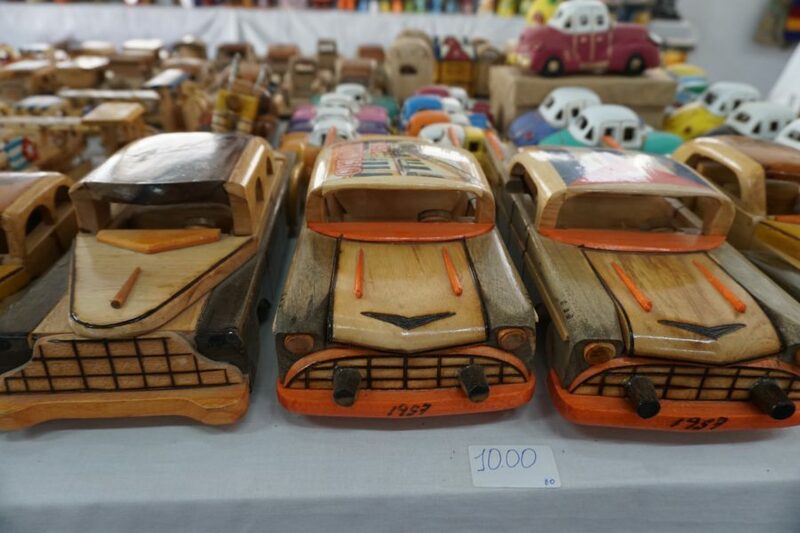 Here are “the best” Cuban souvenirs (okay, the only Cuban souvenirs) I managed to find on my quick trip last month. Let’s start with the indisputable number one souvenir to bring back from Cuba (also part of my Holy Grail souvenir list)– a legal Cuban cigar. Finally, for the first time since pre-Castro days you can now carry a Cuban cigar back into the United States. You’ll no longer have to slip off those coveted Cohiba labels to get your cigars past US Customs. Look for a more in-depth buying guide to Cuban cigars coming soon– but in the meantime, here’s a summary of where you might find cigars in Cuba. 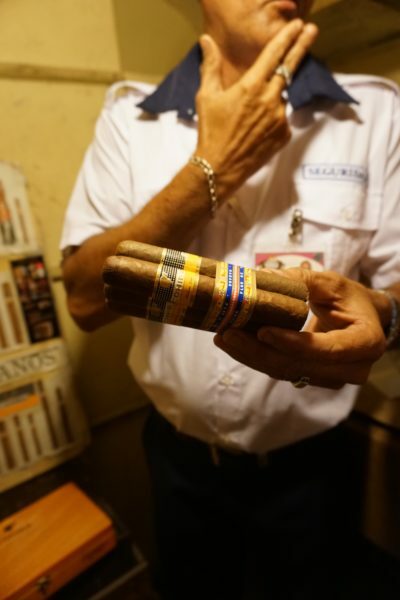 If you’re looking for the real thing, authentic Cuban cigars from some of the best labels in the world, just head straight for any of the Cuban government-owned cigar stores. All of the government run stores sell at identical prices, so it doesn’t really matter where you buy them (many hotels also have small stores inside). For true cigar aficionados concerned with selection, you’ll want to hit some of the bigger shops. Sometimes, the staff will even call around to check availability if you have your heart set on a specific cigar type. If you aren’t sure what Cuban cigars to bring back as gifts, you can’t go wrong with Fidel Castro’s favorites, Cohiba. 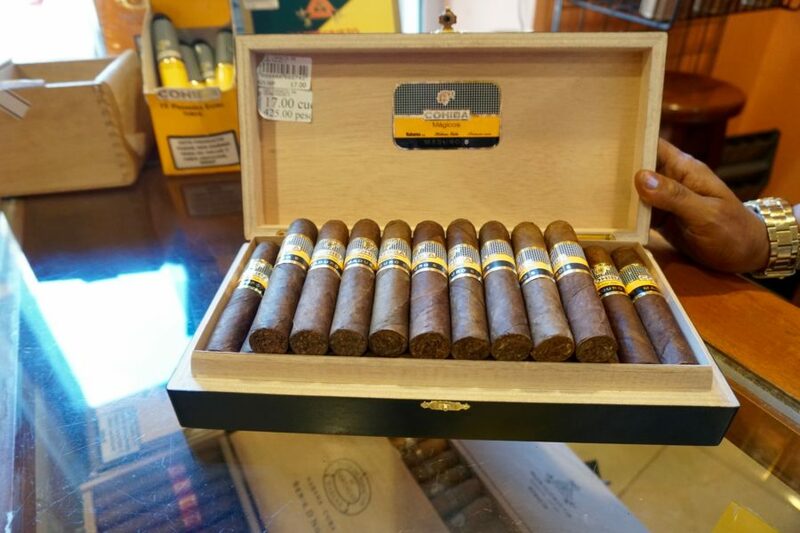 If you aren’t a cigar expert and just want to enjoy the experience of a Cuban cigar without the fuss or high prices, pick up some inexpensive cigars rolled by local farmers right on their tobacco farms. I headed out to the gorgeous valley of Vinales, where I was able to walk through tobacco fields and tour the warehouses and factories where leaves are dried, prepped and shipped off. Local farmers are allowed to keep a portion of their tobacco crop for themselves and sell their handmade cigars to tourists and locals. While these farmer cigars won’t be expertly wrapped to standards of the Cuban cigar manufacturers, they’re perfect for the casual cigar smoker. Each farmer has their own cigar “recipe”– some dip the ends in honey or an herbal concoction for a smooth finish. These farmer cigars run about 1-2 CUC each. You might be offered black market Cuban cigars on the street or even from your airbnb owner, but buyer beware. Unless you are a cigar expert I’m not sure how you would know whether the cigars were legit, and it just doesn’t seem worth the chance. While it’s true that Cuban cigars can be expensive (the really good cigars run $20-$30 each), they are still less than half the price of the same cigars sold outside Cuba, so you’re getting a deal no matter what. This security guard at a well-known Cuban cigar store tried to sell me some black market cigars on the side. For the true Cuban cigar fan, you might as well go all out and buy all the accessories. Along with cigar matches, lighters and cutters, you can also pick up a humidor– an essential for storing those temperamental cigars. 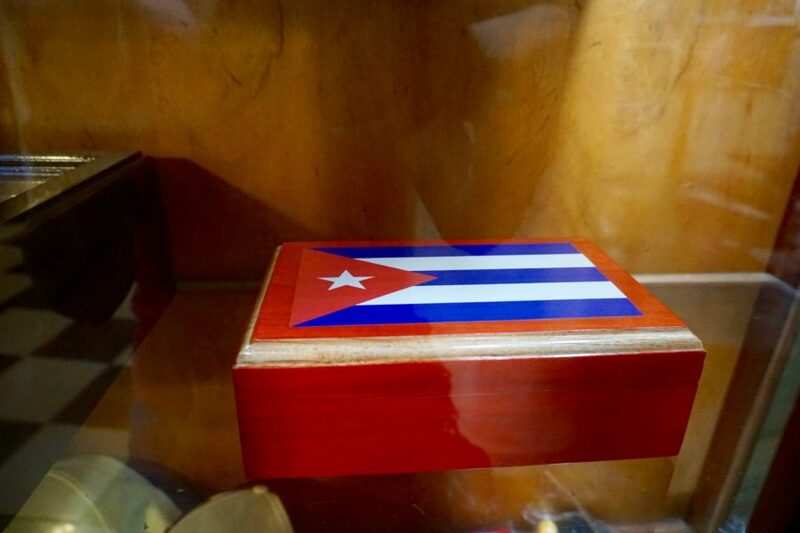 If you’re going to buy a humidor in Cuba, you might as well flaunt it with a classic Cuban flag design. Cuban rum is delicious. Or at least, all of the drinks I had made with Cuban rum were delicious. Sure the fresh mint expertly muddled in the mojitos, or the just-picked pineapples blended into the pina coladas might have had something to do with high drink quality, but the smooth Cuban rum definitely contributed. After taste-testing Cuban rum many times a day, I knew I wanted to bring some home for a souvenir. With only a carry on bag, my Cuban rum shopping options were limited to the airport. Fortunately, the airport shop selection was large– almost too large, as I was bit overwhelmed as to what to get. I knew I wanted to pick up Havana Club three year rum as this was the typical rum used in all the Havana bars I visited, but was unsure what else to look for. As I pondered my options in the rum aisle, a US flight crew came in. “Havana Club 7 year– this is the best stuff” said one of the pilots. After the entire crew loaded up their baskets, I had to follow suit. Look for a more in-depth post on Cuban rum, along with my favorite mojito recipe, coming soon. 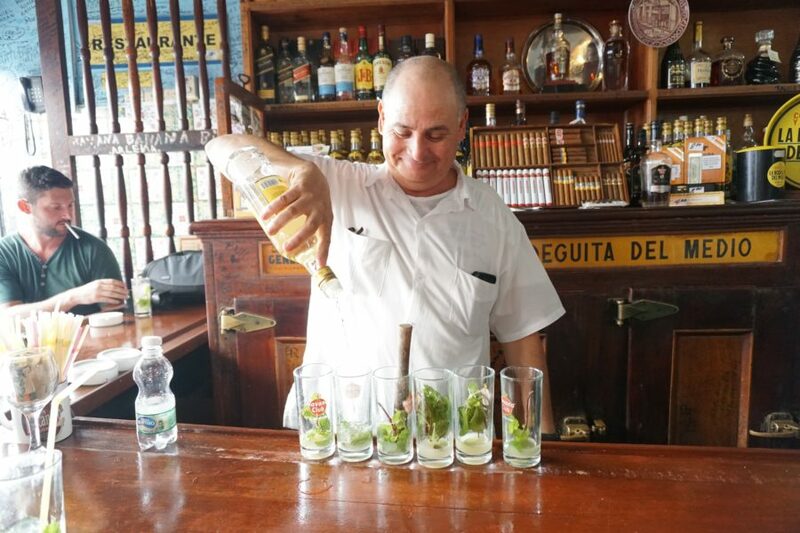 At Hemingway’s favorite Havana mojito bar, La Bodeguita del Medio, I carefully watched the bartender muddle the mojitos. A nice extra to bring back for your Cuban mojitos– Havana Club glasses. I found mine in a cigar shop (about 1 CUC each). 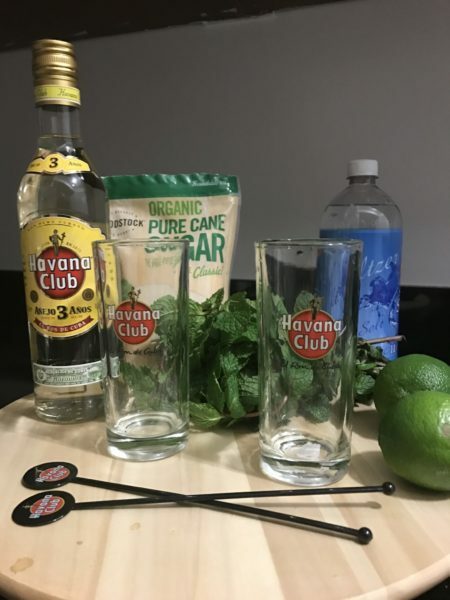 The Havana club swizzle sticks were free– just ask nicely at any bar. I don’t quite have a grasp on the ever-changing regulations around Cuban entrepreneurship, but this much is clear– beyond the nearly identical tourist shops, there is hardly anything unique to buy. I almost gave up looking until I stumbled across my dream shop, Piscolabis. 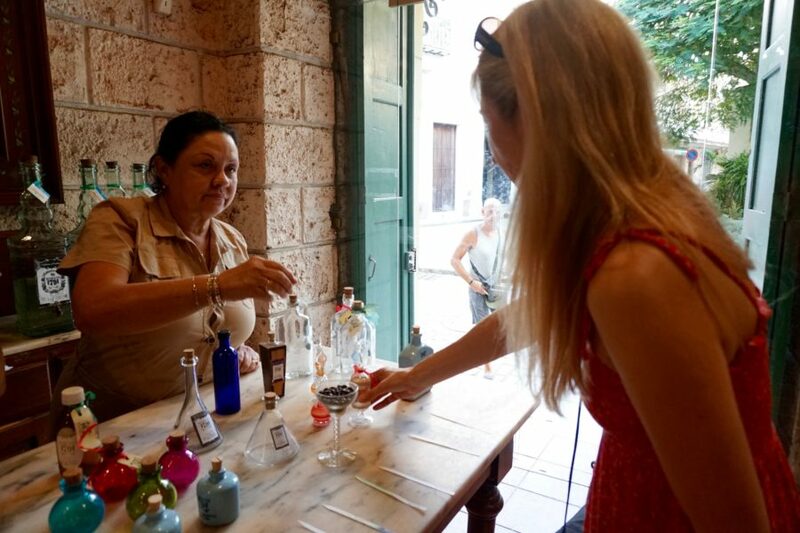 Piscolabis finds local artisans around Cuba and sells their handmade products in the shop. But these aren’t useless tourist type items, these are gorgeous, stylish designs that would fit right in with any trendy Manhattan shop. What I loved is that all of the artisan products sold here are based on Cuba– whether they incorporate traditional Cuban designs, iconic images, or repurpose Cuban products. This is the only shop of its kind I saw anywhere in Havana. One of the few shops in Havana selling original anything, Habana 1791 is a must-stop for souvenir shopper. This gorgeous store creates distinctive scents based on local flowers and plants (including the infamous tobacco plant). 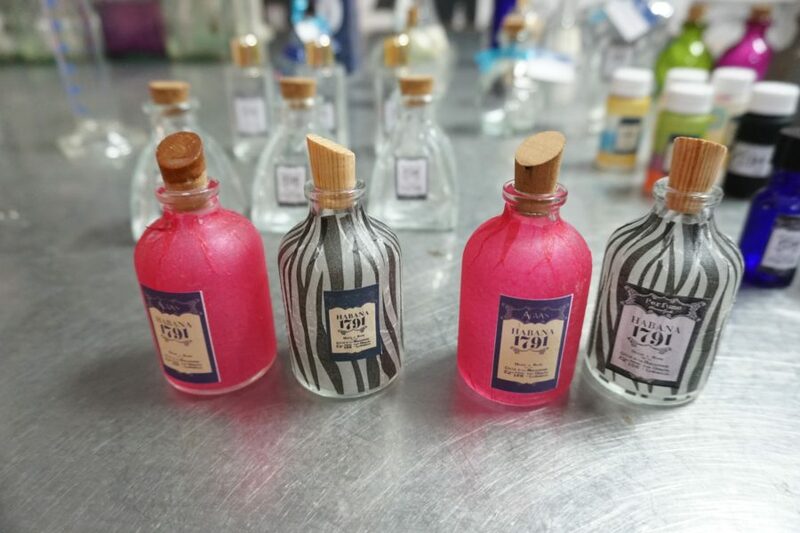 Perfumes are sold in simple containers (starting at 10 CUC) or can be bought in one of their colorful handblown perfume bottles. I admit I did not see much Cuban art on my short visit to Havana. My art souvenir shopping was limited to that which I passed by on the street, in local tourist type shops, or by artists hanging around the main squares. However, my aunt Tracey, a noted artist, made a trip to Cuba last year with a group of well-to-do art buyers during the Havana Art Biennial. After scrolling through her photos of incredible Cuban art, it’s understandable why Cuban art is so hot right now. I hope to base an upcoming post on her gallery and shopping recommendations. Still under US economic sanctions, Cuba faces a lot of shortages of items we don’t think twice about. One of those scarce items is milk. So while other Caribbean islands may make delicious chocolate with their locally grown beans, Cuba is not one of them. I blame the milk. 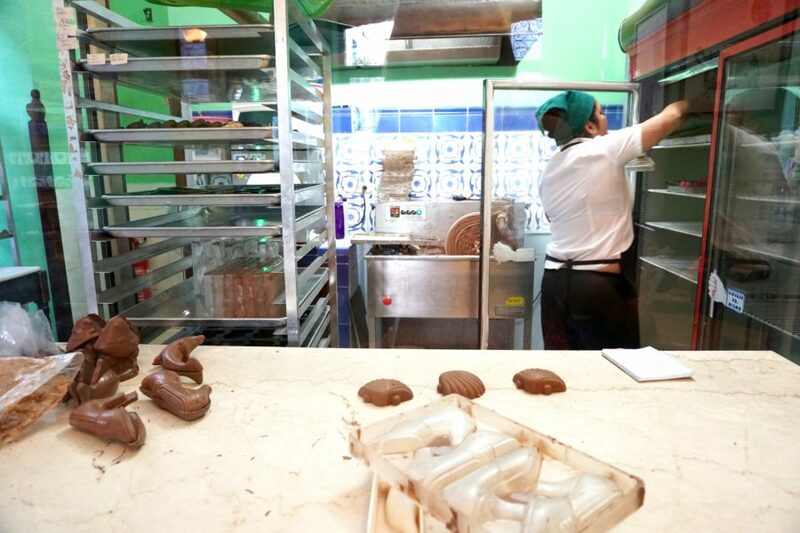 But I still recommend you try it for yourself, and the best place to do so is at Museo del Chocolate in old Havana. A cute Cuban straw hat was on my list of souvenirs to buy. I didn’t care that they were touristy or that no one in Havana wore them, I still wanted one.But after trying on multiple hats at several shops, I had to give up. My head was just too big for those tiny little fedora hats that sit on top of your head. They just looked wrong. So I was delighted when on my day trip out to the Vinales tobacco region, I noticed the locals wearing larger brimmed straw hats. Unlike the miniscule fedora hats, these hats were not only flattering but also useful, the wider brim shielding from the hot sun of the tobacco fields. Straw hats for 5 CUC– maybe not the best quality, but they were cute and kept the sun off my face. I carefully searched through the kitschy Cuban souvenir shops, certain something would catch my eye. After all, this was Cuba, surely Cuban kitsch must be better than less forbidden places? Nope. Tourist tat is tourist tat, no matter where you go. Was I really going to wear a Che Guevara t-shirt or revolutionary hat back home? Did I need a faux Cuban license plate? Having made souvenir shopping mistakes in the past, I already knew the answer. Sadly, I left these shops empty handed. Cuba has a long history with baseball that dates back to the late 19th century. I thought a Cuban baseball jersey or hat from a local team would be a great souvenir. In my pre-trip research I read that Cuban jerseys could be found at local gift shops or at the airport. I off-handedly mentioned my quest for a Cuban baseball jersey to my tour guide in Vinales. Later in the tour while lunch was prepared, my guide appeared with a baseball jersey– not the made for tourist kind, but an authentic Cuban jersey worn by a real Cuban baseball player. My guide bought the jersey right off the player’s back at the end of the season. “A gift” he said, asking only that I bring him a jersey of my favorite team on my return to Vinales. Deal. While I couldn’t find baseball jerseys for sale, I did see some leather gloves and baseballs at a few souvenir shops. I spied these tasty little cookies in a Cuban bread bakery and wondered what they were. 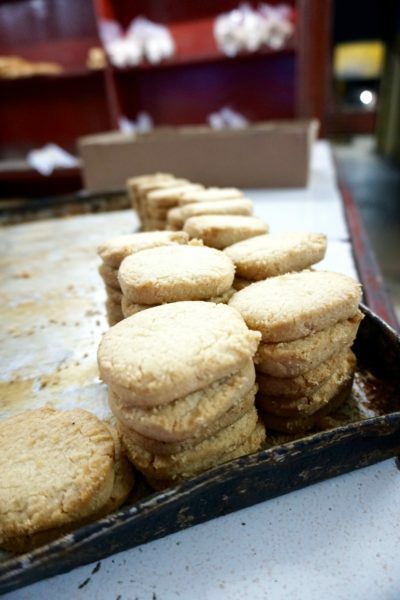 Turns out these are classic Cuban cookies called torticas de morón– basically a Cuban sugar cookie with a refreshing little kick of lime and vanilla.You’ll find torticas de morón at any bakery in Havana. 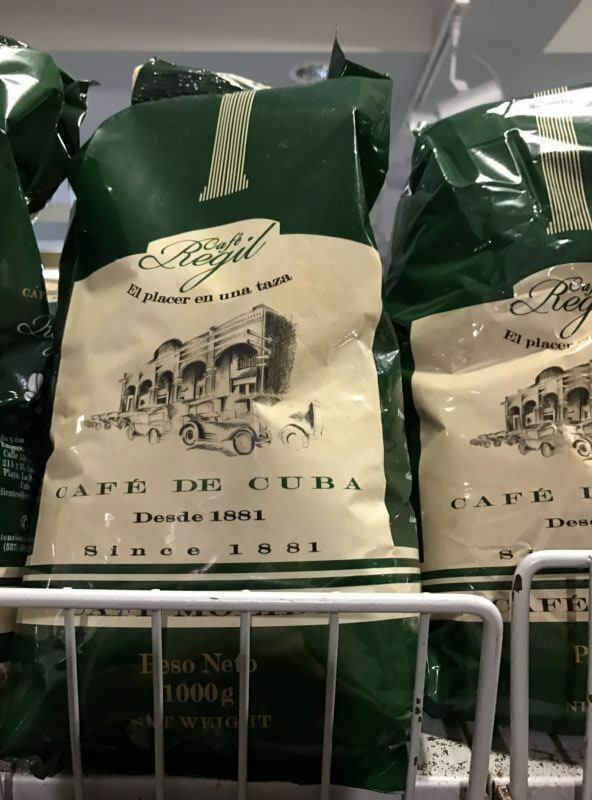 Pretty much everyone at the airport gift shop tossed one of these giant bags of Cuban coffee into their basket. I would joined them except I have no room for a coffee maker and only have a french press at home. Did I miss any Cuban souvenirs or great shops? If so please share in the comments below, I am hoping to make a return visit soon! Aww thanks! 🙂 Follow us on Facebook, happy to take those likes! Hi this isn’t a comment, we will be on a cruise ship is there a tour guide or tour company you recommend? Hi Maria! 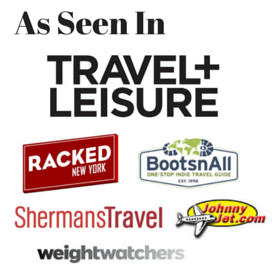 I traveled independently so I can’t recommend one personally. What artists did Aunt Tracy recommend? Ah thanks for the reminder I still have to get the info!! Soon! Great post! I’m heading there in a couple weeks. I am a musician looking to learn a bit more about Cuban music & culture. I was hoping to buy an authentic Cuban Tres or Laud (guitar-like) while there. Did you notice any shops like that? Also are you aware of any upper limit to souvenirs you can bring back? Only thing I’ve read is $100 or less in cigars. The rest seems very open ended. I’m so glad I read this before my trip next week! I’ll keep an eye out for a baseball jersey source down there. Our trip is in 2 weeks. Thank you for the suggestions. They were very helpful! Thanks so much, I’m happy to hear!! Thank for commenting, so glad I could help! Any updates on artists?? I am going in August and want to mostly tour studios and galleries! Thanks! Hi there! I haven’t had time to write it up yet, I hope your visit was great! Any galleries you can recommend? Thank you! I hadn’t seen any useful guides so I was determined to write one! Leaving from SFO (3/18/18) for a 12 day cruise around Cuba – counter-clockwise – starting in Santiago and ending in Havana. My partner and I are each bringing an additional for check-in filled with gifts ~ toothbrushes/toothpaste/bandages/children’s books/lots of toiletries gathered from numerous hotels, several logoed t-shirts and baseball caps and we’ll leave the empty suitcases. A few questions: I want to distribute these gifts as an appreciation for their hospitality, however, I’ve been advised not to give them to ‘just anyone’ on the streets, suggestions? Traveling with very little $$, but of course EVERYONE wants Cuban rum and Cuban cigars. 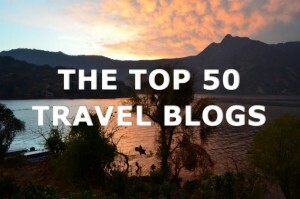 iI’ve read Varadero beach just voted one of the Top 25 in the world, but also a resort. I suspect we won’t have too much time, but an hour or two on a beach would take me to my ‘happy place’ – suggestions? Hi Elaine! As far as distributing items I really have no idea, perhaps look into local charities? I’m not sure of your question are you looking for economical cigars and rum? Cuban rum can be very cheap, and you’ll find smaller bottles at the airport if you need to buy multiples. You can buy singular cigars which I would suggest rather as a gift than a box of terrible ones. I haven’t been to Varadero beach so can’t help there but pls report back if you go! I’m really excited to look for the perfume shop! Barbara, thanks for the tips! Heading there in about 10 days and trying to figure out how much cash I really need to purchase souvenirs. You know rum, cigars, magnets, etc. What do you suggest is a fair amount. Hi Alicia! Sorry I’m just seeing this, I hope you report back and let us know how much you brought and what you bought. It totally depends– my friend brought a couple grand for cigars. I brought $500 or so for tours, food and shopping for 5 days (my airbnb was booked via credit card). I did make it to the last dollar and wish I had more for shopping! Where is Piscolabis? Easy to find from cruise ship? Are we actually required to take tour (people to people requirement) at each port? Hi Chris! Everything I recommend in Havana is in the old city which is very safe and the area you would most likely be exploring anyway. You’ll have to check the state department’s latest regulations, I went when rules were different, and I also qualified as a journalist, so I am unsure what your status or requirements are.